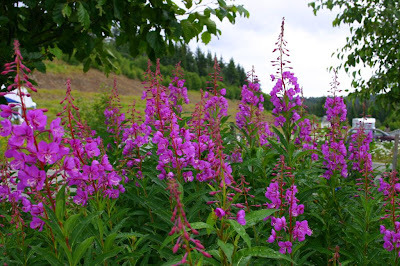 After enjoying our stay in Seward, Friday we moved up on the Kenai Peninsula to Soldotna, where we joined our friends, Fred and Jo at the Klondike RV Park. They pulled into camp just before us, so we each got settled in this nice looking park. Later we had a Happy Hour and got to meet Mel and Joann Nadler, friends of the Wishnies, who are on a birding caravan, this was their vacation time away from the caravan. It is such a small world! We’ve been reading the travel blogs of their Wagon Master for years now, Bert Frenz! He’s an incredible birding leader! Mel and Joan have added lots of birds to their lists! They’ve also have been to Gambel, Nome and Barrow for extra birding adventures with Bert! They needed a break from all of that running around. It was great to finally meet them. All of the other RV parks along the river are for the fishing folk, packed like sardines in gravel parking lot fashion. Since we aren’t fishing, we opted for grass between the roomier sites. We were handed a “Handbook” on all of the rules while staying there. One of the key things to keep us paranoid was “thou shalt not let your dog urinate or defecate in the park. If so you will be asked to leave without refund”. Since we were so lucky to get a site at the end, right next to the road, we walked our buddy Raider on the highway for his needs. I’m glad we were only staying a few days, through the weekend! There was a dog run at the back of the park, but what if your dog has an accident before you get there?! And then there was Mama Moose and baby moose to watch out for in that area, too! RV Fulltiming has it’s unique experiences, that is for sure! Saturday we drove over towards the town of Kenai and tried out luck on finding some birds. It was a cool gray day, but I managed to spot a Short Eared Owl flying low looking for his lunch, along with several immature Bald Eagles and a lone coyote in the field. The coyote was keeping an eye on the black Labrador retriever, near us, picnicking with his family. We headed back to camp because we had a side dish to make for the potluck . Mel and Joann hosted the party at their site with several barbecues ready. Everybody brought their own meat to barbecue. Besides Fred, Jo, Mel and Joann, we met Gordon and Juanita, as well as Mary and Mike Camp that evening. Gordon writes a travel blog, too and we’ve been following his adventures since Dawson Creek, they are traveling a few weeks ahead of us. It was great to finally meet them. Mary and Mike are from Escapees, which all of us belong to, and they were also a delight to meet! Right away we hit it off. No longer strangers when it comes to sharing RV stories while traveling Alaska. Great food and drink, good company, what more could we ask for?! Well, perhaps some sun would’ve been a nice addition! It was still gray out, and we were all bundled up in layers with sweatshirts, but by 9:00 the wind kicked up and we all retreated to our individual homes on wheels! It was a loop trail, a little steep, but pretty. Grant was walking ahead of me, the mosquitoes were eating him alive. We’re just about 75 feet of the parking lot, when he starts walking backwards!! UH OH!! I yell, “What is it? !” He tries to whisper, “Moose”. As I come up from behind him, there’s this huge female moose right at the very end of the trail, half standing in the parking lot and half in the plants. She’s as big as a horse and watching us very intently. We had to bushwhack through the underbrush to get to the truck, avoiding her! With all of the noise we were making she apparently wasn’t startled, she just kept grazing! Since we hadn’t planned on anything but getting to church on time, neither one of the cameras was back in the truck!! Talk about frustration!! Oh man, we could have had great photos; she was less than 20 feet away!! After lunch we wandered over to the town of Kenai to check it out. This area was first founded by the Russians, so there’s lots of history to be found. 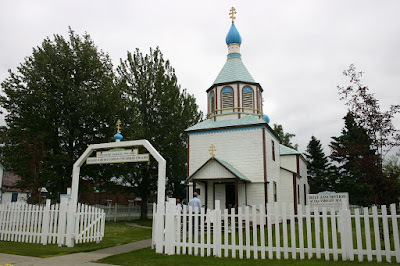 There are several Russian Orthodox churches nearby, and one was open to visit, called the Holy Assumption of Mary. The priest was dressed in his long black vestments and was quite friendly if you had any questions. The sanctuary was quite small compared to the building itself from the outside. One thing different, there were no pews or chairs. Their liturgies are done standing or kneeling. It was the first time I had seen the inside of a Russian Orthodox church. Like a lot of our birding, it seems the birds have moved on already! We didn’t find any shorebirds on the beach, just gulls. Perhaps they’ve already gone south because the weather is so much more like fall than it is summer! Oh damn, too bad you couldn't get pics of the Moose! a. (often initial capital letter) the bodily taking up into heaven of the Virgin Mary. b. (initial capital letter) a feast commemorating this, celebrated on August 15. Neat, you've got good timing to be there for the feast!